Broccoli consumption has increased more than 940% over the last 25 years. It could be because broccoli contains a good amount of protein and is one of the richest vegetable sources of calcium, iron and magnesium. 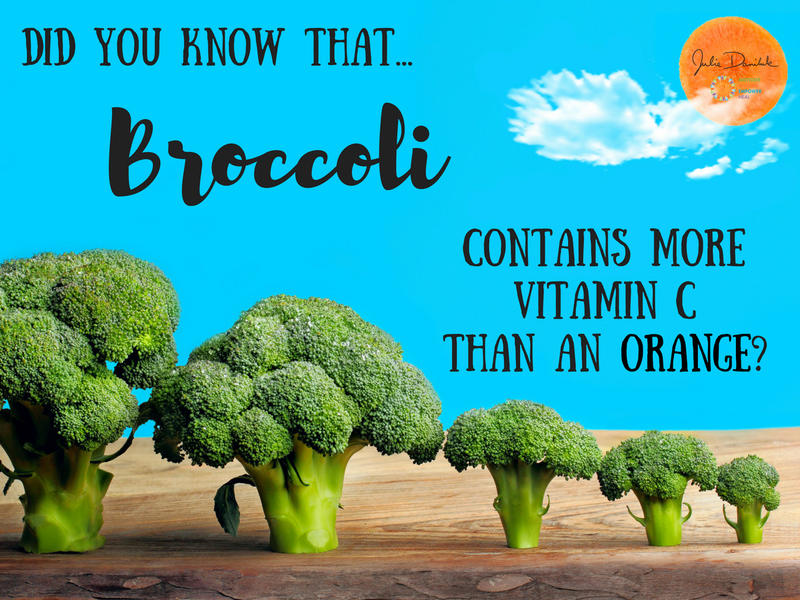 Moreover, broccoli boasts good amounts of Vitamin A, and contains more Vitamin C than an orange! Broccoli's sulforaphane content supports the second step (called Phase II). 1. Broccoli may relieve asthma symptoms. Sulforaphane is a naturally occurring chemical found in broccoli. This interesting molecule increases the amount of active Phase II enzymes of the upper respiratory tract, helping with symptoms of asthma. These enzymes are responsible for neutralizing the harmful toxins you breathe1 every day, toxins which can cause respiratory distress – especially for those with respiratory conditions. 2. Broccoli is loaded with fibre. Foods high in fibre and nutrients can help weight loss efforts by increasing the feeling of being full, thereby urging you to eat less. Fibre is also necessary to “soak-up” the toxins2 dumped into your intestines by your liver. Without fibre, the toxins are reabsorbed into your body, wreaking havoc on your system. 3. Broccoli may protect against tissue damage from Diabetes. Diabetes-type tissue damage is caused by sharp glucose crystals circulating in your bloodstream. The naturally-occurring chemicals in broccoli, flavonol glycosides and hydroxycinnamic acid, are responsible for antioxidant protection3 4 that help combat free radical tissue damage. 4. 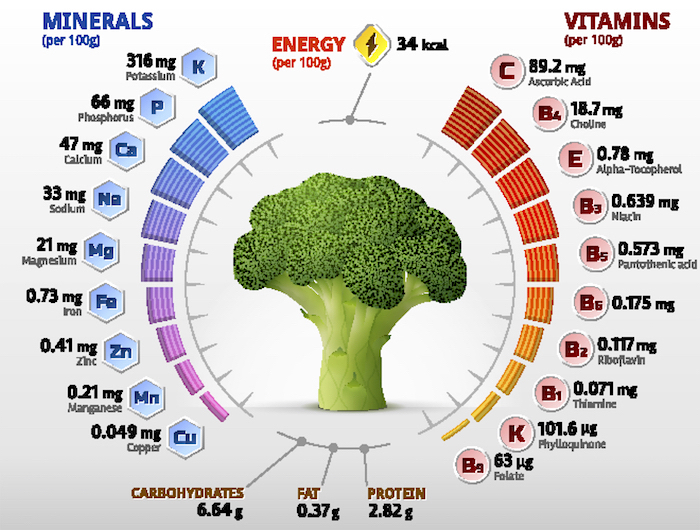 Broccoli is a good source of many B vitamins. Broccoli is excellent for women that are using, or have previously used, oral contraceptives (the birth control pill). Oral contraceptives are proven to dramatically reduce levels of circulating B vitamins in the body.5 The B-complex vitamins are required for a number of metabolic reactions in the body including fat and carbohydrate metabolism for proper energy production. 5. Broccoli can stop replication of colon cancer cells. 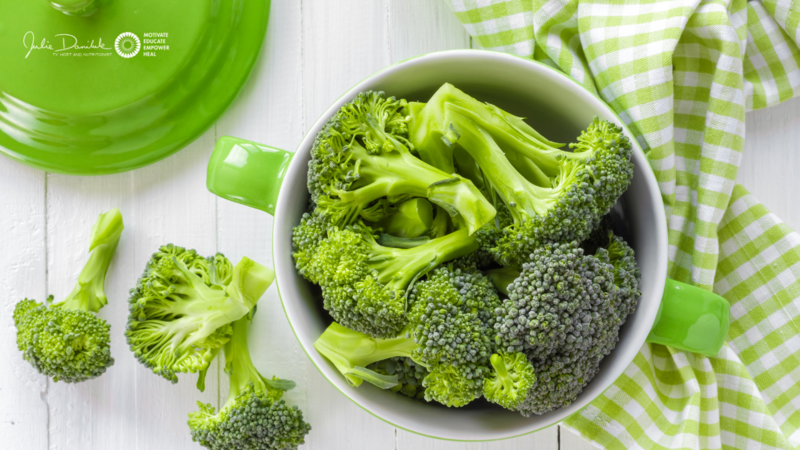 The beautiful green colour of broccoli can be attributed to its high chlorophyll content. Chlorophyll helps to alkalize your body and has the ability to stop replication of colon cancer cells6 by arresting the cell's abnormal cycle. "Oral sulforaphane increases Phase II antioxidant enzymes in the human upper airway." Riedl, Marc A., Andrew Saxon, and David Diaz-Sanchez. Clinical immunology 130, no. 3 (2009): 244-251.
" Dietary fibre: a roughage guide." James, S. L., J. G. Muir, S. L. Curtis, and P. R. Gibson. Internal medicine journal 33, no. 7 (2003): 291-296. "Activation of NF-E2–related factor-2 reverses biochemical dysfunction of endothelial cells induced by hyperglycemia linked to vascular disease." Xue, Mingzhan, Qingwen Qian, Antonysunil Adaikalakoteswari, Naila Rabbani, Roya Babaei-Jadidi, and Paul J. Thornalley. Diabetes 57, no. 10 (2008): 2809-2817. "Protective effect of sulforaphane against oxidative stress: recent advances." Guerrero-Beltrán, Carlos Enrique, Mariel Calderón-Oliver, José Pedraza-Chaverri, and Yolanda Irasema Chirino. Experimental and Toxicologic Pathology 64, no. 5 (2012): 503-508. "Oral contraceptive use: impact on folate, vitamin B6, and vitamin B12 status." Mc Wilson, Stephanie, Brittney N. Bivins, Katelyn A. Russell, and Lynn B. Bailey. Nutrition reviews 69, no. 10 (2011): 572-583. "E2F4 and ribonucleotide reductase mediate S‐phase arrest in colon cancer cells treated with chlorophyllin." Chimploy, Korakod, G. Dario Díaz, Qingjie Li, Orianna Carter, Wan‐Mohaiza Dashwood, Christopher K. Mathews, David E. Williams, George S. Bailey, and Roderick H. Dashwood. International Journal of Cancer 125, no. 9 (2009): 2086-2094.